Hi, I am interested in your 1957 Buick Caballero (stock #1117-NSH) listed on Autotrader for $79,995. I'd like to get more information about this vehicle and confirm its availability. This unique Buick station wagon is cool!. Buick only produced them for 2 years because they were expensive to build, so there were only about 14,000 were ever made. Its a great 50s wagon with gorgeous body lines. The restoration included an engine/drivetrain rebuild that is well documented and new paint. Red and White two-tone with tons of chrome, this car is a classic 57 model car. The massive front bumper leads with rocket shaped protrusions on each side. A grill of vertical lines has a red, white and blue circle with wings off each side of it in the center. Chrome dresses out the headlights and spotlight mirrors are perched proudly on the fenders. A slash of chrome down the side of the car separates the red from the white, curving up and over the rear fender with Caballero in script as it turns up. The pillarless window frame cuts a complimentary line to the two-tone treatment and creates a stunning look. The back of this 57 is extra awesome because its a wagon. Another massive bumper with an integrated gas cap has chrome art deco taillights dressing up the end of the tailfins. The tailgate says Estate Wagon on it and drops down and the curved rear window folds up revealing a massive amount of room inside. Open the drivers door and check out the beautiful interior. The door panel itself sets the theme in two tone Red and White with chrome accents. A big, wide, comfortable bench seat is covered in red and white vinyl with red piping. A white steering wheel has a full circle chrome horn ring and a coat of arms in the center. The dashboard has a black padded upper with a polished aluminum panel across the dash from side to side just below it. There is a horizontal speedometer with engine gauges above it and heating and ventilation controls below it. The stock, rocket shaped dash vents are supplemented by a Vintage Air A/C system mounted below the dash for those hot summer days. The original Sonomatic AM radio is still in place but there is also a more modern FM/CD player hiding in the glove compartment. A split folding back seat offers different options for seating vs luggage and a white headliner and red carpeting tie everything together nicely. Open the hood and you find a 364 cubic inch V8 nestled down in a neat and clean engine bay. The engine was removed at one point and completely rebuilt from the crankshaft up with new bearings and quality machine work to recondition the block as well as the heads. The heads received some extra love to upgrade them to run unleaded gas, and everything was painted back to the factory correct colors. While they were at it, the Dynaflow 2-speed transmission was rebuilt, the rear end had the cover removed so it could be cleaned and inspected, the axle shafts were pulled and serviced, the suspension was serviced and of-course the brakes were serviced and reconditioned too. Power steering and power brakes make the car easy to maneuver in parking lots, and its a Buick, so you know it rolls down the highway comfortably. The car sits on super sweet Buick Skylark wire wheels with wide white wall tires all around. 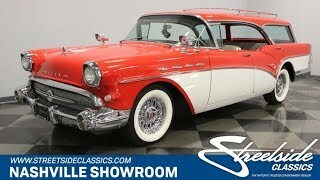 This is a great looking 1950s station wagon that attracts attention, runs great and is fun to drive. Come on down and check it out. You may decide to take it home with you.